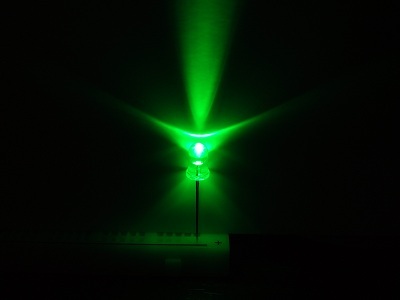 This Green (525nm) 5mm LED is quite bright and looks great in any project needing a really nice deep green illumination. The forward voltage is 3.3V with a current consumption of 20mA. 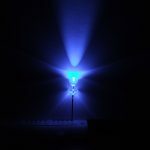 The LED is rated at 6500mcd with a view angle of 20°. To use this LED you will need a current limiting resistor; this will vary depending on your input voltage. Typically with a 5V supply we recommend using a 100 ohm resistor for a single LED. SKU: LED-015. Category: 5mm LED. Tags: Component, LED, Light Packet.